Problems with Outside Air Conditioning Condensers – Morrison Inc. Feeling comfortable in your own home is critical for the health and happiness of you and your family. Freezing in the winter or sweating in the summer can result in sickness and a trip to the doctor. A heating and cooling system is an obvious requirement for your home, however, the type of system determines your level of comfort, efficiency and cost. What’s that sound? In older homes, the source of cooling in the warmer months is a window air-conditioning unit. Regardless of advancements in technology, the excessive noise cannot be eliminated. The units regularly turn on and off, generating a consistent audible rumble throughout the room. Larger homes require several units to lower the temperature in the most-used rooms. In a home or building with a central air-conditioning unit, the noise is predominantly outside. The condenser turns on when the ideal temperature is out of range. Depending on the size of the home, more than one outside unit can be running simultaneously. Why let the annoying hum of an air conditioner ruin the fun while you’re grilling or chilling in the pool? With a geothermal system, all equipment is installed inside the home, typically in the basement or the mechanical room, near the water heater. Not only does the geothermal system provide a comfortable home, it delivers a very quiet environment and peace of mind. An outside condenser requires attention year-round, and some additional expenses. Industry HVAC experts suggest surrounding the base of the unit with small rocks to help with drainage from excessive rains. Water accumulations of more than six to eight inches can damage the unit. For some areas, hail guards are recommended to protect damaging the fins and the refrigerant coil. Heavy winds can also send debris flying into the unit damaging the condenser’s fan grill. Even small objects can get caught inside the unit causing blade damage, blockage or harm to the structure. Since a geothermal system doesn’t have an outside condenser, you don’t have to worry about environmental damage. Criminals or vandals can also affect your outside condenser. Copper tubing from inside the condenser doesn’t fetch much money, but the damage caused to the unit will cost you a lot of money. Another, more disturbing threat to the unit comes from people stealing the Freon. Thieves have been reported to be huffing the deadly chemical to get high. To help protect your outside condenser, you can replace the valves on your unit with locking caps. For more insurance, you can protect your unit by installing motion-sensor lights, or even surveillance cameras. 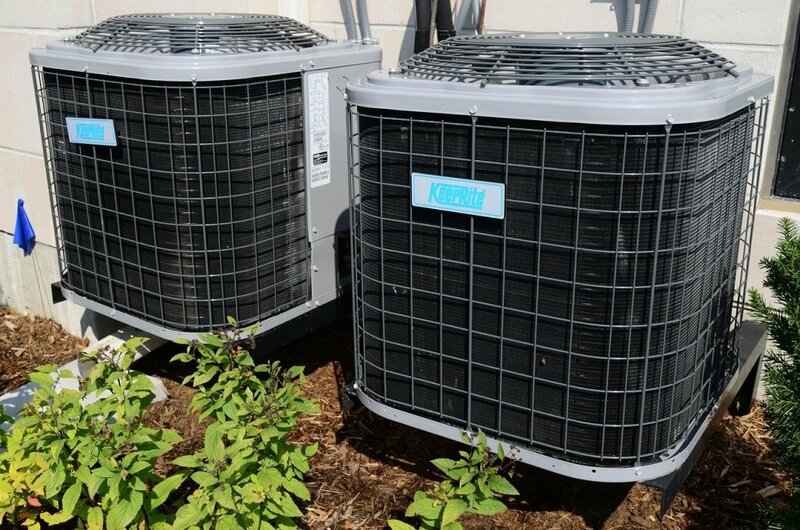 Other options include connecting your condenser unit to your existing alarm system or surrounding the unit with a wire cage. Considering your HVAC system is the single most costly system in your home, you need to consider the best option for your budget. You should estimate yearly maintenance, monthly usage fees and the cost to replace the unit. A geothermal system also has a quiet interior unit that is protected from the environment and vandals. How do you keep comfortable and protected from the elements?